What is more fun than a party? A party planned by Casino in Motion, of course. 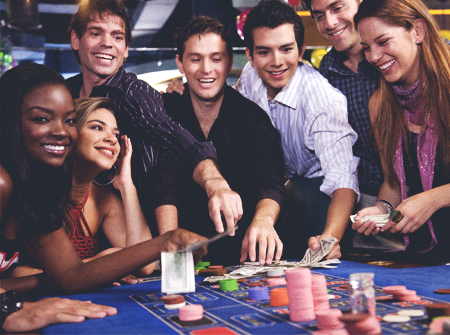 For the ultimate experience in casino party entertainment in Glendale, CA, our party planners can help you plan the perfect night of casino fun and excitement that friends and family will reminisce about for a long, long time. With the assistance of our party planners, we can make sure all of the necessities for a night of fun are easily at hand through our complete event staging. With our party rentals and access to so many outstanding vendors, we will help you stage an event everyone is sure to enjoy. So, go ahead and plan the themed casino party of your dreams; to celebrate a birthday, retirement, or to raise funds for your favorite charity, we will take care of the details for you so that you can work on your poker face. Just remember to make sure you have all of your required licensing taken care of before inviting everyone to your casino party! Whether hosting a casino night or looking for something a little different for your special event, Casinos in Motion is proud to offer a mobile bar and bartending service. This fantastic service is adaptable to most environments and will help transform even the most mundane setting into one that is exciting. Whether you are hosting the annual family BBQ or a surprise party, having a mobile bartending service helps you remain focused on your guests. Casinos in Motion is Southern California's premier poker tournament, as well as casino table rental company. We have a large roster of dealers that have worked at casinos in Las Vegas, Atlantic City, and other major gaming hubs. Our trained professional card dealers have dealt hands to many celebrities, as well as for many well-known businesses. With Casinos in Motion, you can choose from a wide variety of fun casino games. You may choose from several packages that will fit your budget perfectly--no budget is too big or too small. We can accommodate from just one table up to 40 tables or more for your casino party entertainment. Our amazing packages include the best casino equipment that is made specifically for the top casinos in Las Vegas. But remember that our equipment is for training purposes only. Fundraising gets competitive because there are so many great charities out there. The market is oversaturated with catalogs and candy sales. When looking to stand out from the crowd, and raise plenty of money, planning a casino night with Casinos in Motion is a great way to help your organization reach their goal. We offer reliable party planning services, table rentals, and a mobile bar all within a 25-mile radius of Glendale, CA. Contact our casino party planner for more information on party packages and how to obtain the right licensing. No matter what package you choose, our fun, professional dealers will make sure you have a great time and learn all of the rules and proper etiquette of a casino. Casinos in Motion's chips are just like the real chips that you can find in any casino on the Vegas strip. Add a magician or celebrity impersonator to make your event an authentic Las Vegas experience. Call us today and let us help you plan your Vegas experience party. We proudly serve Glendale, California, and surrounding areas.